North East India is heaven unexplored; Indian Holiday presents a well-crafted itinerary to experience Nagaland along with other delights of the North East. Embark on a 14 nights and 15 days tour offering you a chance to explore the natural beauty, wildlife, monuments and the tribal culture. 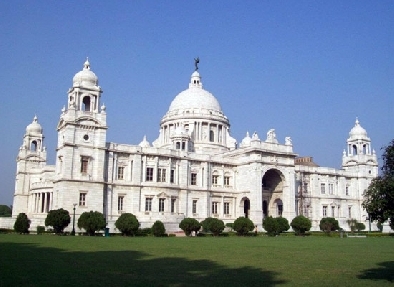 Start your tour from the ‘City of Joy’ Kolkata. Later pay a visit to cities like Dimapur, Kohima, Touphema, Guwahati couples with wildlife safari at the UNESCO Listed Kaziranga National Park. Learn the complete details of your trip with the detailed itinerary given below. Once you reach Kolkata, you will get an assisted transfer to your pre-booked hotel. The day is free for leisure activity; you can do anything you want to. Relish the lip-smacking street food, interact with the locals or explore the local bazaar and the nearby surroundings. Stay overnight. 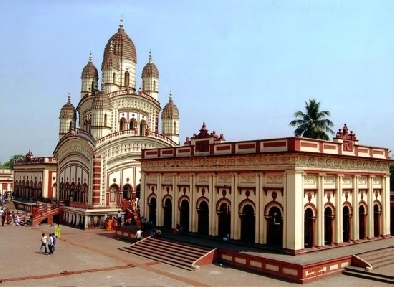 Today, you are going to enjoy a city tour of Kolkata where you may cover attractions like Howrah bridge, Victoria Memorial Hall, Indian Museum, Dakshineshwar Kali temple, Maidan, Alipore Zoological Garden etc. Dinner and overnight stay in Kolkata. On the 4th day of your tour, you are going to enjoy sightseeing in Kohima. The first attraction of the day will be Kohima War Cemetery, built in the memory of soldiers who died during the Second World War. Later, you will proceed to Bara Basti, the second largest village in Asia, built by Angami ancestors. The village has traditional Naga houses. The entrance of the village is embellished with the horns of Mitun (buffalo) and motifs of guns, a symbol of the bravery of the tribal people. The last visit of the day will be the State Museum, housing Naga artifacts of around 15 tribal groups. Overnight stay. Day 5 of the tour will begin with breakfast. Later, leave by road for the Khonoma village (2-hr). A two-hour drive from Kohima will take you to this village which is the headquarters Angamis. This village has served as the base for Angami rebels who fought ferociously against British invaders in the Naga hills in the year 1879. Do the activities of your interest. Observe the lifestyle of the people living here. Stay overnight. Day 6 is for exploring the village. Have your breakfast and enjoy the local scenery. Take a walk around the village, interact with the locals, and discover the rich wildlife in the surrounding forest. Stay overnight. Once you have your breakfast, in the morning, you will further drive deep into the central part of the Naga Hills, inhabited by the northern Angami. After you arrive here, check-in at your pre-booked hotel. Once you have your lunch, explore the lush green hillsides that will offer a view of Myanmar. Overnight stay. On the 8th day of the tour, you are going to walk across the Angami and Renga villages. 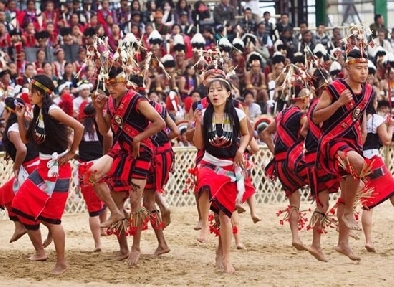 The people of these two tribes are very well-known for their colorful festival dances. Explore the surroundings and observe their daily activities. Enjoy dinner around bonfire. Food will be served from an authentic Naga kitchen. Stay overnight. Today, you are going to get transferred to the Kaziranga national park. Have your breakfast and hit the road. On the drive down, you are going to cross the green hills, followed by the plains of Assam, which are sprinkled with lush tea gardens and dense forests. Once you arrive at the national park, check into your jungle lodge. The day is free. If you want then you can explore the surroundings on foot. Overnight stay. Day 10 is for a full-day safari into the national park. This world heritage site houses two-third of the world’s population of One-horned rhino. It also has a good population of the Eastern Swamp Deer and Asiatic water buffalo. The national park also boasts of being home to around 483 avifauna species. Overnight stay. 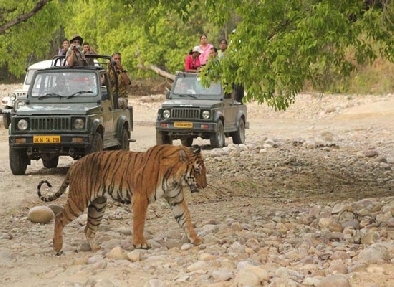 The day is divided into morning and evening safari (elephant or jeep safari). Explore the vast variety of flora around you along with the fauna. Stay overnight. On the 13th day of the tour, you will begin driving towards Guwahati where you are going to cross villages, tea gardens and jungles. On arrival, check into your pre-booked hotel. The day is at leisure. You can indulge in the activities of your interest. Enjoy sightseeing, admire the local scenery or visit the local bazaar. Stay overnight. In the morning, get an assisted transfer to the airport, to board a flight to Kolkata. On arrival, complete the check-in formalities at your hotel. Indulge in activities of your interest. Explore the surroundings, interact with the locals, visit the popular markets or attractions or relish the street food. Stay overnight. Today, you are going to get an on -time transfer to the airport or the railway station to board a flight or a train for your onward journey.